22 September 2016 – Bahrain’s second High Civil Court of Appeals today upheld an earlier court decision to dissolve Al-Wefaq National Islamic Society, the largest political opposition group in Bahrain. The undersigned NGOs strongly condemn the court’s decision, which is representative of the Government of Bahrain’s broader efforts to silence civil society. On 14 June 2016, Bahraini authorities suspended Al-Wefaq. The Ministry of Justice and Islamic Affairs requested the civil courts approve its dissolution, and they subsequently released an expedited decision to close the society. Bahraini authorities immediately seized and shut down Al-Wefaq’s headquarters. They also froze the society’s assets and halted all of its activities. Additionally, Bahraini officials blocked Al-Wefaq’s website in the kingdom. Originally, the court had set 6 October 2016 as the commencement of the case to dissolve Al-Wefaq. However, in response to a request by the Ministry of Justice, the court moved the trial forward twice. Al-Wefaq’s legal counsel had previously pulled out of all legal proceedings as security forces prevented them from entering Al-Wefaq’s headquarters “to get the necessary documents to prepare our defense and support it with documents.” On 17 July 2016, the High Civil Court affirmed the order and formally dissolved Al-Wefaq in the absence of any defense counsel. Today’s decision to uphold the dissolution of Al Wefaq coincides with the escalation in government repression. Last year, Bahraini authorities sentenced Al-Wefaq’s Secretary-General Sheikh Ali Salman to four years in prison on charges relating to his right to his free speech and peaceful political activity. In a case of double jeopardy, in May 2016 an appeals court upheld his sentence but convicted him on another previously dropped charge. Sheikh Ali Salman, who is a Shia cleric, is now serving a nine-year sentence related to a peaceful speech he gave in 2015. The UN Working Group on Arbitrary Detention considers him arbitrarily detained. Additionally, in May of 2016 the Bahraini government made an amendment to the political society law preventing religious figures from entering politics. Repression against civil society greatly escalated this past summer as authorities targeted human rights defenders, issued travel bans against activists, and revoked the citizenship of the highest Shia cleric, Ayatollah Sheikh Isa Qassim. The level of repression against the Shia population has reached such levels that five UN experts issued a statement calling on Bahrain to stop its “persecution” of the Shia community. Nevertheless, the authorities have only intensified their ongoing campaign against Shia religious leaders. Since June 2016, Bahraini authorities have interrogated and/or detained over 60 Shia clerics on charges related to free expression and assembly. Just yesterday, a court sentenced three Shia clerics to a year in prison each on charges of “illegal gathering” related to their participation in a peaceful sit-in. This brings the total number of Shia clerics recently sentenced solely for exercising their rights to free expression or assembly to seven. We, the undersigned, condemn these actions which limit civil society space, exclude sections of society from politics, and which curtail and criminalise the rights to free expression, assembly, association and religion, as protected under the International Covenant on Civil and Political Rights and the Universal Declaration of Human Rights. 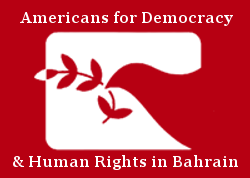 We call upon the United States, the United Kingdom, and the European Union to denounce the recent actions by the Government of Bahrain, to immediately suspend all arms sales to the kingdom, to urge the government to reverse its decision to dissolve Al-Wefaq Society, and to pressure the government to commit to respecting human rights. We also call on the Government of Bahrain to immediately reverse this decision, to commute the sentences of Sheikh Ali Salman and all prisoners of conscience, and to end reprisals against civil, political, and religious society in Bahrain.